This time for Creating a Cover we’re going back to a two-part story from Justice League Adventures #25 and #26. The story had Superman, Wonder Woman, the Martian Manhunter and Batman transported to the alien world of Rann where they have an adventure with space-faring hero Adam Strange as a guest star, and I got to draw a recap of his origin which was a lot of fun. Sketch A: This was my first design. 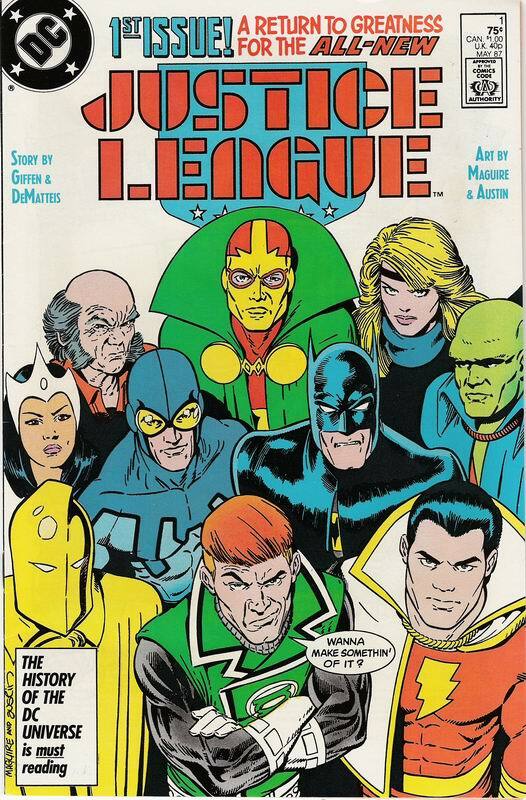 I liked the Adam Strange figure and the alien T-Rex, but there wasn’t much room for including more members of the League, which I was guessing DC would want. Sketch B: This take on the same scene featured all the Justice League characters clearly in a bad way, but I didn’t think it did as good of a job showing off our guest star Adam Strange. Sketch C: One more perspective on the same basic scenario – this time an aerial view. I liked this one, as it showed all four involved Justice League members, clearly in jeopardy, and was a great beauty shot for guest star Adam Strange. This was probably my favorite of the four designs I submitted. Sketch D: The one other idea I included was a throwback to the Silver-Age era that Adam Strange is associated with. It keeps the menace a mystery, but shows Adam Strange confidently pushing the League out of the way on the cover of their own book as he takes center stage to announce himself. I didn’t think they’d go for it, but it would have been fun to draw. Pencils: As it turns out, they asked for the Adam Strange and T-Rex monster from Sketch A combined with the Justice League figures from Sketch B. I had to flip their orientation and re-arrange them a bit to get the composition to work, but it didn’t turn out too badly given it being a Frankenstein combo of two other ideas. I managed to get a bit of the Rann skyline in there to help establish this as an alien world as opposed to a pre-historic time period or something. Colors: The colors looked fine, although with a night-time sky it would have been nice of the skyline in the background would have looked like a night-time skyline. Final: It amuses me that the dialog given to Adam Strange is so similar to what I’d suggested for Sketch D. It might have been a coincidence given that it’s pretty generic expository bombast! (THAT was a fun phrase to type!) I wish the dialog balloon didn’t cover part of Adam Strange’s body. So issue 25 left each Justice League member in a cliffhanger situation, and I’d had the brainstorm of taking advantage of Adam Strange’s costume designs to use his chest straps to create a multi-frame cover design that would tease each of the cliffhangers that were to be resolved in the pages of Justice League Aventures #26. At the end of the previous issue, a weakened Superman was being threatened with an axe, Batman had just found a murder victim with a knife in his back, Martian Manhunter was threatened by a pack of the alien T-Rexes as seen on the previous cover, and Wonder Woman was tied to a rocket. All these scenarios were happening simultaneously, so I really liked this as a tease for the multiple resolutions. I loved the multi-frame thing with the red areas of Adam Strange’s costume between the white straps, and I highlighted the threatening element in white in each frame for extra visual interest. Sketch B: My editor liked the Adam Strange design part, but wanted the Justice League members in more action-oriented situations. He asked to have the inset scenes changed to ones where Superman was battling an undersea creature, where Batman was being held at gunpoint, where Wonder Woman was fighting a giant robot, and the Martian Manhunter scene could stay the same. Not only did I not like this as much conceptually, but these scenarios were challenging to depict in a very small, irregular area and keep the Justice League figures large enough to be prominent. Also, this drawing didn’t lend itself to highlighting the threatening elements in the same way, so I tried highlighting the League member’s eyes in white instead. The above layout is what I came up with. It was OK< but already I didn’t like this as much as the original. Pencils: The pencils turned out OK, and I made sure the editor knew to pass the color sketch I had done along to the colorist for reference, as the color treatment was a big part of the whole concept. Inks: The inks were again by Dan Davis. Colors: For me this is where it started to fall apart. I don’t blame the colorist, I think this was a communication breakdown. Unfortunately, I didn’t have any input into the color on this title, so by the time I saw the color version of the art it was final and there was nothing to be done. Rather than more stylized color, the art is the regular colors for the characters just tinted red, and there’s shading applied to the red on the Adam Strange figure which to me makes the inset art look like weird tattoos. The area on Adam Strange’s belt that was intended as a highlight is colored like it’s surface detail, like an off-center belt buckle. It doesn’t look bad, it’s just wrong, and inconsistent with how the character looks elsewhere in the book. The color on Adam Strange’s face doesn’t seem to have the same underlighting scheme the line-art does. The biggest change is the addition of a space background. I think it changes the way the whole piece plays, and the sparse stars don’t read to me as a space background, the just look like hastily-added white dots. Final: So there’s the final cover. It’s not a terrible cover, but it’s not what I’d intended. I think the “Strange Days!” text to the left of Adam Strange’s head makes the open space to the right seem oddly empty – it unbalances an otherwise symmetrical design. Ah, well. Rarely is a piece of art everything you want it to be, and the reader doesn’t know what you’d originally had in mind. Unless you do something silly like write blog entries where you do deeply into the behind the scenes process of how you design covers. 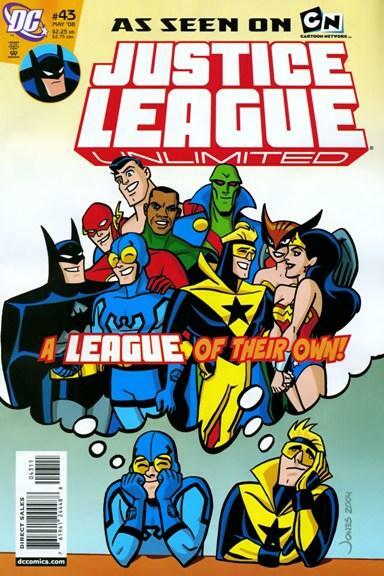 I couldn’t have been more excited when I got the script for an issue of Justice League Adventures I was to draw that featured guest stars Blue Beetle and Booster Gold and was written by Keith Giffen. 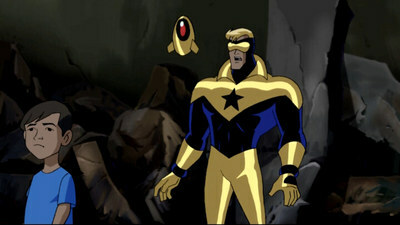 Beetle and Booster were key players in the much-loved 1980s incarnation of the Justice League comic book, that mixed drama and humor in a Buffy-esque sort of way with a League comprised of B-listers like Beetle and Booster, Guy Gardner, Fire & Ice and others with serious mentors like Batman and the Martian Manhunter. It was gloriously absurd stuff, and was written by J.M. DeMatteis and… Kieth Giffen! Justice League Adventures was the tie-in comic to the then-current Justice League animated TV series, and was in continuity with that show rather than the “mainstream” DC Universe Justice League comics. In his story “Wannabes,” Keith brought his magic to the animated incarnation of Justice League, and had Beetle and Booster at the beginning of their superhero careers encountering the experienced Justice League. Beetle and Booster spent the story bickering in their best style, and the sparks flew in hysterical ways as the Justice League reacted with exasperation at their antics. 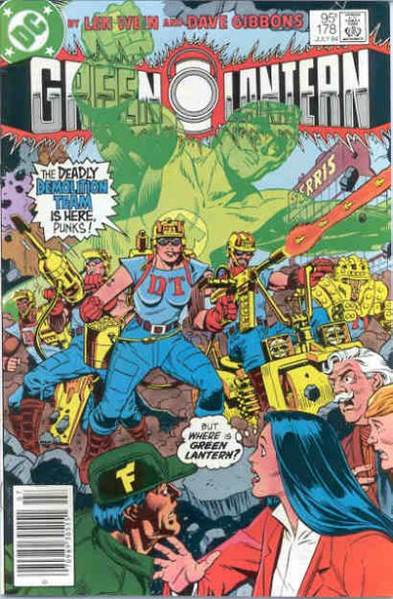 Plus, Keith Giffen indulged his love of obscure, ridiculous characters and used the existing DC super-villain group The Demolition Team as the bad guys. It was great stuff. I was so excited to draw it, and my love for the material showed page-by-page in the artwork as I worked through the issue. There was concern expressed by the powers-that-be at DC Comics that Wannabes might conflict with the show’s depiction of Booster both in terms of his visual appearance and in terms of story continuity. My position was… “who cares?” The Atom appeared in the tie-in comic before being used on the show, and his costume was different and was written with a distinctly different characterization when he appeared on the show, and the world didn’t end. If Wannabes appeared when scheduled, it would be almost a year until the announced TV episode would be completed and would air. By then Wannabes would be such old news I couldn’t imagine anyone really caring about whatever minor differences might exist between the two versions of the character. But that’s not how the powers-that-be felt. It was decided that Wannabes would be shelved until the TV episode aired and we could see whether the comic represented a calamitous continuity error. 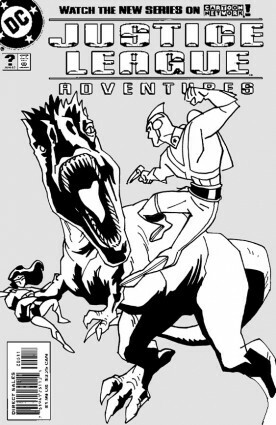 I was terribly disappointed, as Wannabes was my favorite work on the Justice League Adventures series to date – story and art – and while I was paid for my work I really wanted it to be seen! So a year goes by, the TV episode aired, and it turned out that their version of Booster was almost identical to ours. Not surprising really, as it was based on the same source material. The visual character design was similar to mine, and the character was portrayed as an attention-craving newbie working with the League and could easily have been seen as a follow-up to the comic’s “first meeting” story. Good news, though, right? Now there’s no reason not to publish Wannabes, which had been gathering dust on a shelf somewhere in DC editorial. Right? When the Justice League TV show changed to Justice League Unlimited the comic was re-branded as Justice League Unlimited as well and started over with a new #1 issue. DC used this re-branding as an opportunity to bring the comic in-line with it’s new Johnny DC brand for all it’s animation based titles and kids books, which included cutting the page count of the stories from the DC-standard 22 to 20, and using those two extra pages for a kids-friendly letter column section. The result of which was that the Wannabes story was now two pages too long to fit the new format. I never understood why it why it would have been such a big deal to cut a couple of pages of in-house ads from the issue or cut the letter column for one issue, but this problem kept Wannabes from seeing the light of day for another three-and-a-half years, until the Justice League Unlimited TV show was coming to an end and the tie-in comic was being wrapped up as well. Finally motivated to use the paid-for inventory stories that were sitting around unused (there was more than one – I actually had drawn TWO of them! ), these stories saw print as “untold tales” of the Justice League, and the length problem was solved by cutting two pages from the story. I wasn’t happy about the cuts, but I was happy that at least the bulk of the story finally was to be seen by an audience! Wannabes finally saw print as Justice League Unlimited #43. The pencils from this story – including the two missing pages – are up in my gallery. Give ’em a look!